It was a crisp September morning known as Murrai’yunggory time (Cool and getting warmer. Time to prepare for the summer food) when Uncle Billy woke to a frosted dew over the camp. The little gurungs were still asleep, curled up to their wiyangas (mummas) under possum skin blankets. Billy woke the gurungs and picked them up in is big burly hands carrying them over to the fire. 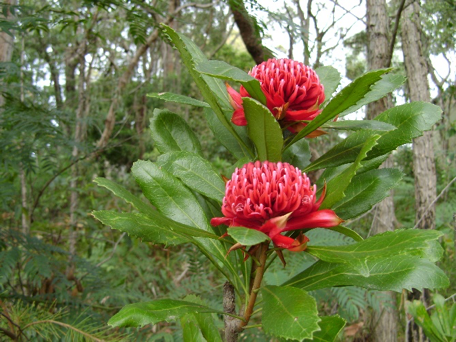 Curled up in Uncle Billy’s lap he showed them the blood red sunrise peeking over the horizon and he started singing about krubi and the story of the waratah. “Many, many seasons ago a young man and a beautiful young woman of the wrong skin fell in love. They kept their love in secret and would meet high up on a sandstone ridge. This love affair went on for a long time and inevitably the young woman fell pregnant. So, the young lovers had to tell of their affair. Scared but strong the young man faced the elders and told them what had happened. The elders were furious at their betrayal of lore and banished the young man from their Country. The beautiful young woman named Krubi begged to be able to go with him but was forbidden by the elders. The young man promised Krubi that he would return for her once their baby was born. Krubi waited and each night dreamed of her love returning and taking her with him. After the birth of their child Krubi walked up the same sandstone ridge in hope for the return of her love. She dressed every day in the red skin of the rock wallaby, graced with the red crest of the Gang-Gang cockatoo across her soft dark skin. Heart broken and holding their baby, she sang soft comforting songs to soothe the child and guide her love back to her. After two seasons when her love failed to return she stayed all day and all night on that sandstone ridge singing the sweetest of tunes to her child and for her love to hear and find his way to her. Eventually Krubi could not take her heartbreak any longer and willed herself and their baby to return to the earth spirits. After three seasons her love secretly returned looking for Krubi and their child. He found his brother and on hearing what happened to Krubi, he secretly visited the sandstone ridge where Krubi last stood. Every day for three days in secret Krubi’s love knelt at the spot of Krubi’s last stance for their forbidden love and he shed a tear upon the earth. On the third day, a beautiful red flower blossomed which had the sweetest of nectar and the brightness of a morning red sun. He knew this to be the spirit of Krubi showing him her beauty and the nectar, food for their baby. Les Bursil; Some words of the Sydney Aboriginal groups.